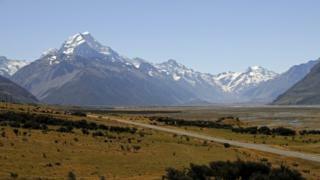 The body of a New Zealand hiker has been formally identified, more than 40 years after he disappeared. David Erik Moen was 19 when he was caught in an avalanche on the Tasman Glacier, in South Island's Aoraki Mount Cook National Park, in 1973. It was not until earlier this year that his remains were found, and his identity confirmed through DNA testing. Mr Moen's family paid tribute to a "great outdoorsman" whose loss "was felt enormously by us and his friends". "We cannot put into words what it feels like to have David returned to us after all this time but we are taken back to when he first went missing in 1973," they said in a statement. "David's spirit still remains in the beautiful, peaceful environment which claimed the life of a wonderful and dearly loved young man in the prime of his life," they added. David Moen had been out climbing with a friend in September 1973 when they were swept away by a wall of snow. The body of the friend was found, alongside David Moen's bag. But Mr Moen's body remained undiscovered for 42 years until it was found, in what local media described as a "well-preserved" state, by two climbers in February this year. Another set of human remains was found at the nearby Hochstetter Glacier in March, but police have yet to make an identification.